vision of the kind of city they wish to live in; one in which resources are cornered by the privileged few thereby leading to exclusion and conflict or one with dynamic diversity where each individual’s worth is understood and acknowledged thereby encouraging interdependence and integration. Moreover the people need to reclaim their own right to the city by establishing and engaging in democratic management over its urban rediscover the principles of deployment. 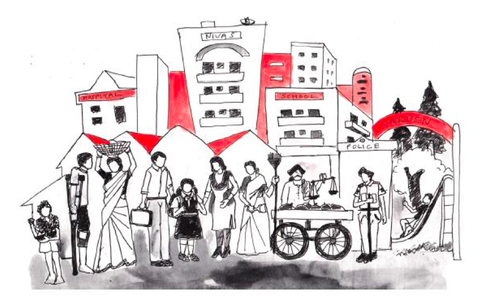 The city of Mumbai – presently – is an epitome of inequality and poverty that plagues our urban centres. The informal settlements that dot its landscape and the homelessness that is visible on the streets are a testimony to that. 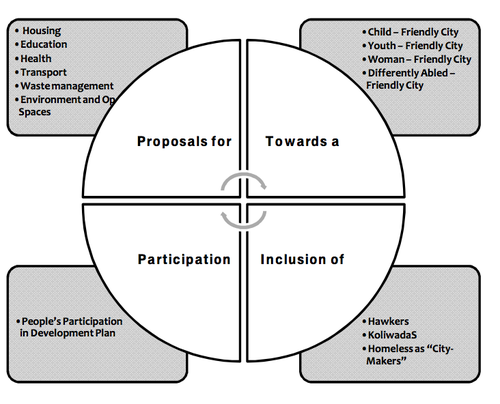 Exclusion of the urban poor – who form the majority in Mumbai – is set into the biased and non participatory top down process of formal development planning. This leads to undermining the rights of majority of its residents, thereby worsening the already abysmal conditions of the poor denizens in Mumbai. for us to assert our right over our city. The new Development Plan (DP) slated for 2014-2034 should address the various issues the city is currently facing and propose a holistic approach to tackle the same. campaign called Hamara Shehar, Hamara Vikas, Hamara Niyojan, Abhiyan (Mumbai)]. This document enlists the demands of people for their city – to be included in the upcoming DP – from 14 important aspects. These 14 categories have been represented graphically below. As can be seen, these categories vary from the most hotly debated issues like housing, education and health to some unexplored issues like the needs of the hawkers, children and homeless. other marginalized sections, and its development would reflect the needs and aspirations of Mumbai’s underclass, which has been consistently left out until now. —One of the last notes left behind by Mahatma Gandhi in 1948.